I embarked on MY yogic path in 2002 when I discovered Anusara Yoga whiling living in Los Angeles. I was immediately drawn to a practice focused on alignment that invited me to connect to my mind, body andsoul. Once living in Miami, I decided to delve deeper into my self-development path, completing my Life Coach Certification with iPEC. This certification helped to transform my life and lead myon the path to a career as a yoga and meditation teacher, and sparked my journey to open The SAGEuary. 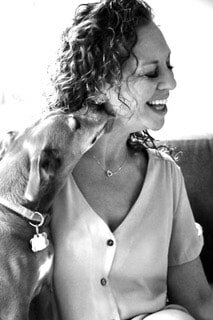 I earned her RYT 200-hour yoga certification, began to explore vibrational sound healing techniques through playing Crystal andTibetan Sound Bowls and most recently completed a Mentorship with Jodi Carey of Flowintuit Yoga, earned my Yin Certification with Rae Indigo of United Yoga, and am currently completing my IYTA Kundalini Yoga Certification. Ollie hails from the Humane Society, he is a rescue dog, but who rescued whom is the question that always remains in this partnership. Ollie loves long walks, kisses, snuggles, chasing squirrels and greeting guests at The SAGEuary. I strive to bring kindness, compassion and maternal energy to every class; I am sensitive to the individual needs of my students. I cultivate a nurturing and self-expansion environment, leaving students with a deeper connection to self and a recharged sense of focus and calm.